Cape Town cooking and fine dining at its best! If you are a foodie and would love to see one of the top Cape Town chefs in action, then you definitely should book a Cape Town Cooking class at The Foodbarn in Noordhoek. A real feast awaits you when you join one of Franck Dangereux's cooking demo classes and afterwards sit down for tasting the delicious meal. Franck Dangereux is an award winning French chef who already had gained experiences in star-studded French restaurants before coming to South Africa. Here he worked as well at some renowned first-class restaurants in the Cape which includes La Colombe in Constantia, which was named one of the top 30 restaurants in the world while under his reign. 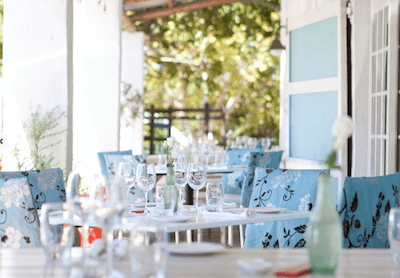 In 2005, he acquired The Foodbarn, which is now one of the most popular Cape Town restaurants and loved by local gourmets as much as by visiting tourists and families residing in the area. Franck is a wonderful down-to-earth celebrity chef who has a very friendly and highly motivated team around him. During a Cape Town cooking class with him you will learn about Franck’s passion for fresh ingredients, special cooking methods and simple food creations which will excite not only his own family, friends and children. In his cookery theatre at the Foodbarn, Franck will also let you in some secrets of sourcing special ingredients in Cape Town. During our cooking demo, Franck cooked one of this signature dishes, fresh line fish, tuna, with an exotic onion, seaweed and coriander broth on a bed of oven-baked potato slices with smoked salt. It was truly fantastic to watch the demonstration of his cooking skills and even more exciting to feast on one of the signature dishes at the atmospheric The Foodbarn. The restaurant is stylish yet comfortable. 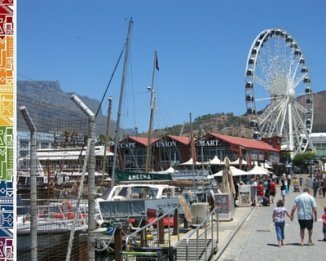 It is located at the entrance to Noordhoek Farmvillage just South of Chapman’s Peak Drive and attracts people from all over town. The cooking demonstrations take place in the evenings. The following four classes can be booked: French Classics, Easy Entertaining, Success with Sauces and A Festive Feast. Learn more about the demos and book your Cape Town cooking classes here. The restaurant host special wine and food pairing events and chef's tables were very popular in recent years. Enquire with the restaurant should you be interested in taking part in any cooking demos, catering or special events. Catering available? Yes, minimum 200 plates. Enquire here. Reservations needed for dining there? Yes, definitely. Even if the restaurant is not too busy during the week, Saturdays and Sundays are quite mad at the farm village with lots of families enjoying the warmer spring days and the lovely market atmosphere. If you want to make a booking for Saturday or Sunday at the Foodbarn, you should book well in advance not to be disappointed to find all tables booked up already. Please take note, they introduced a deposit fee should you want to book a table for six or more people. Book your table here. 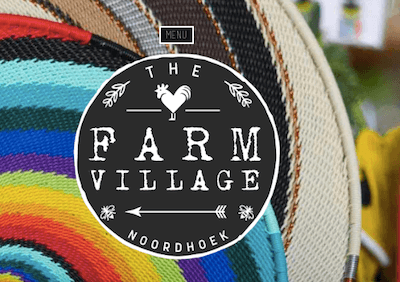 Eat out in Noordhoek and what else to do at the Noordhoek Farm Village? If you still have got space for some more treats make sure you visit The Foodbarn Deli in Noordhoek Farm Village. Get a packet of the delicious peacan nut balls which are so light and fluffy it will be hard to resist eating them all up tight away. Or the heavenly Florentines….oh soooo yummy! 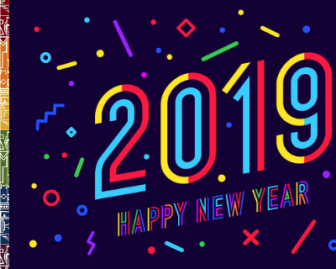 And I could go on and on… so book a place and enjoy the special menus. What else to do in Noordhoek Farm Village? Go curio shopping and support the local arts and crafts scene, visit the little art galleries and enjoy wine tasting, shop for organic veggies and homemade breads, cakes and meals at the delicatessen or enjoy free concerts and kids activities every Saturday. Find more info about the Farm Village here.